When the Dieselgate emissions scandal broke, Volkswagen put a stop sale on TDIs and eventually started buying back hundreds of thousands of affected cars from customers. Hundreds of those cars now sit in the abandoned Detroit Lions stadium parking lot, others are rotting on a decommissioned California Air Force base, and thousands are being held at a port in Baltimore. The photos of these oceans of cars are a sad sight. At the moment hundreds of thousands of Volkswagen TDIs are currently in limbo, as VW waits to see if they can get the EPA and California Air Resources Board to approve fixes for the cheating cars, or if the company will be forced to send the vehicles to the salvage yard. Once a buyback transaction is complete, Volkswagen will remove the vehicle from the dealership and store it at a regional facility. These vehicles will be held until it is determined whether an approved emissions modification becomes available. After a bit of hunting on forums, and a couple of tips from readers and friends, I seem to have found three such “regional facilities”: one in Pontiac, Michigan; one in San Bernardino, California; and one in Baltimore, Maryland. The Pontiac Silverdome is a bit of a shitshow in southeast Michigan. It used to be the proud home of the Detroit Lions and the Pistons, and it was even the venue for Super Bowl XVI, multiple NCAA tournament games and some FIFA World Cup matches. But now the huge building lies dormant, with its interior decaying and its parking lots cracking after years of neglect. Some automakers use the lots to store cars, and Fiat Chrysler even did burnouts at a Roadkill Nights events there last year. Now, the Silverdome is mostly just a giant pathetic eyesore on the southeast Michigan landscape. So I followed the truck until it turned into an entrance for the Silverdome, where the driver checked in with a security guard, and drove in to dump his loot. I took a few pictures, and left after a very annoyed security guard confronted me. Man, just look at all of these poor VWs. Sitting. Lonely. Just hoping that someday someone will take them on 50 MPG+ road trips again. Michigan is hardly the only place where you can find a massive lot full of TDIs. I found a thread on TDI Club Forums where one user, Ram4Sam, had come upon an airport lot filled with TDIs. Over email, Ram4Sam told me the airport was in San Bernardino, California on a remote part of Norton Air Force Base, which has been decommissioned for over 20 years now, as is now part of the San Bernardino International Airport. You can actually see the cars on Google Street View here. The forum-user says there are over a thousand California-plated Volkswagens and Audis in that lot; he went on to tell me he recognized the windshield markings on the cars from when he turned in his own 2015 VW TDI last month, indicating that he thinks this airfield lot was indeed a holding lot for cars that had been bought back from customers. 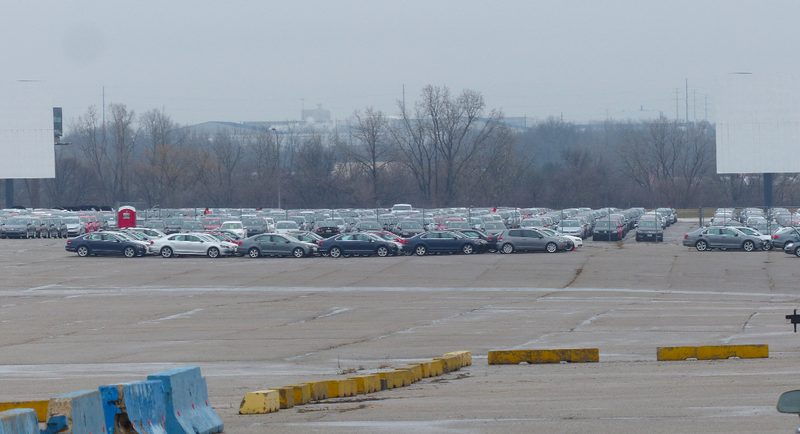 A reader named Nathan Brown sent me some pictures of a VW holding lot in Baltimore. He had grown suspicious of a nearby TDI lot after frequently seeing transporters moving VW diesel vehicles during his daily commute. Nathan had also seen posts on social media with pictures of TDI-filled trucks headed north from D.C. All that, plus the fact that he knew Baltimore was a major automotive import/export hub, drove Curtis to head out last weekend on a mission to find the land of the bought-back TDIs. I found a total of five storage lots with what had to be thousands of cars, ranging from older Mk5 Jetta models to high line Audi A3s, Passats and MQB Mk7 Golfs and a huge quantity of Jetta Sportwagens... Several of the lots stretched much farther than I could see. He said all the cars were in exceptional condition, “with very few if any showing any dents, dings or damage,” (some bought-back cars weren’t returned in quite such condition) but that they were definitely used; the bumper stickers, modification, and older-generation cars gave that away. So this is almost certainly a lot filled with bought-back VWs. The pictures of these lots are heartbreaking. Once, Volkswagen TDIs were such good, efficient, torquey, handsome and (mostly) reliable vehicles. They were beloved by owners and enthusiasts alike. Now they rot in these parking lots, their potential wasted, all because VW couldn’t be bothered to follow emissions laws. Even more sad is the fact that these cars used to be peoples’ babies—their prides and joys, responsible for bringing newborns home from the hospital and taking college kids to their first job interviews. It’s that human element—that little taste of the previous owner brought out by things like bumper stickers and custom license plate brackets—that makes seeing these cars in such a state so depressing. But still not quite as depressing as the Pontiac Silverdome.